Eye Magazine | Opinion | What has writing got to do with design? ‘I don’t have to design in my English class, so why should I write in my design class?’ It was as though I had asked my students grow Streptococcus in a Petri dish in lieu of specifying type. Translating verbal messages into visual forms is the essence of graphic design, I argued. The manipulation of language and typography is the primary ingredient that distinguishes our work from that of illustrators, who deal exclusively with imagery. So why the intense resistance, both in the classroom and in the profession? Graphic design is neither strictly visual nor strictly verbal. It is the marriage of the two: fused, bonded, inseparable. As the instigator of such visual / verbal / typographic fusion, the output of the Futurists and Dadaists is often considered the pivotal work of twentieth-century ‘graphic design’. From Marinetti to Tristan Tzara, these artists and poets liberated language from the stronghold of the vertical and horizontal axes – on the surface, at least. More importantly, they fused for the first time content and form into a unified whole. The words grew in harmony with the form; they sprang from the same source. Graphic design has a tendency to view historical work for its interesting surfaces while overlooking the contributory elements that make those surfaces interesting. The central aspect of the Futurist and Dadaist language-based work – total authorship of words and form – is frequently bypassed and the work is seldom shown in translation. In the shadow of that agonising contradiction between design rhetoric and practice, where designers profess to admire one thing (culture) but base their practice on another (commerce), too little attention has been paid, both in the academy and in the annuals, to the relevance of writing to graphic design. Writing can feed the profession in two ways: through the challenge of critical analysis and through the exploratory freedom of self-initiated work. The role of the author, in the traditional sense of a writer, is considered beyond the realm of the graphic designer, despite our canonisation of works of total authorship. We admire the giants of design history who wrote manifestos, books, or self-published periodicals whose form was an expression of the ideas they expounded: Theo van Doesburg’s De Stijl, Jan Tschichold’s Die Neue Typografie, Emil Ruder’s Typographie, Paul Rand’s Thoughts on Design. These polemics created lively debate and enriched the visual culture at the time of their publication and continue to do so today. They helped shape a discourse from within, in much the way architects and artists have done. Critical reflection in graphic design is in short supply. Too many publications are merely lavish portfolios. While it is nice to view interesting new work, in such forums the work is accepted outright: no discussion, no questions asked. The profession needs challenge from within through the reflective process writing can bring to it. Long overdue, such critical introspection can help broaden our understanding of what we accept as natural. We can then choose to accept it as it is, or to change it for the better. While the world of criticism can at times be fraught with internal politics and fashions, it is at the very least a forum for discussion. Through discussion and review we are held accountable to our peers, and as a result worlds of praise carry greater weight. Constructive criticism should not be something we fear; it should be something we welcome. At the same time, self-initiated, self-authored design work can be the locus for professional growth through experimentation with language and form, as in the work of Phil Baines. With complete control over all aspects of the communication, the graphic designer as author, in the tradition of Marinetti et al, has the freedom to explore more deeply the relationship between content and form, including issues which may be inappropriate to client communications but relevant to design. Autonomous works of total authorship must be considered a valuable contribution to graphic design. This is not to say that commissioned work should be devalued, but rather stimulated by the issues that only autonomous work can bring to the discussion. The situation in the Netherlands, where government and commercial organisations encourage visual exploration through subsidies and commissions, has created a fecund environment for experimentation. In Holland, the spirit, impetus and support behind autonomous production still thrives. 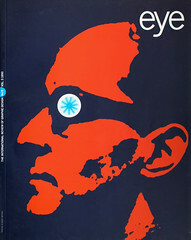 Typ, Hard Werken, Qwerty, Affiche – all magazines initiated or edited by Dutch designers – as well as numerous small books and catalogues are in constant circulation. The notion of the designer as complete author, editor, and form-giver is alive. Government grants and commercial sponsorship, such as printing donations, promote design for its own sake for both professionals and students. Community support empowers the designer as a cultural contributor, with the freedoms and responsibilities that role entails. In the UK and US, the same economic support for endeavours outside the circle of commerce is hard to find, the subtext being that it is of no value unless it can turn a profit. Unfortunately, many designers have the ability to write, but don’t. This reticence may result from two things: a professional identity bound too closely to the demands of industry, and the way this constrictive self-definition is reinforced through an educational stance that thwarts the advance of visual and verbal exploration and inhibits critical reflection. The commercial concerns of the profession can overshadow critical discourse, in that public analysis and review are seen by some as endangering business, and as such as distinctly ‘unprofessional’ activities. But while the over-emphasis on business concerns can be a hindrance, I would argue that the more difficult obstacle to overcome is the anti-verbal bias of much education, which renders designers voiceless, opinionless, mindless. It is considered outside our role to analyse the content of our work in relation to politics, theory, economics, morals, and so on. This is a fallacy: we always lend some degree of interpretation to our work. By acknowledging this involvement and by actively increasing it through autonomous projects and analytical reflection, we strengthen our communication skills as authors and consequently as interpreters. To understand how content communicates and how it relates to visual form is mandatory for the student. Students can use writing to build intellectual muscle and to provide themselves with the mental tools to evaluate ideas, allowing them to adopt from the outset a responsible position of questioning and analysis. No longer a neutral medium through which another’s ideas flow, the student, and later the practitioner, is an active participant with a stake in the communication process. Can we resurrect the spirit of authorship that is alive in our most valued historical moments? It is the mode of exploration and evaluation in the activity of writing – in many ways parallel to the design process – that is significant: the practice of manipulating words and expression feeds a designer’s ability to communicate. Designers should write not in order to become better writers, but to become better designers.